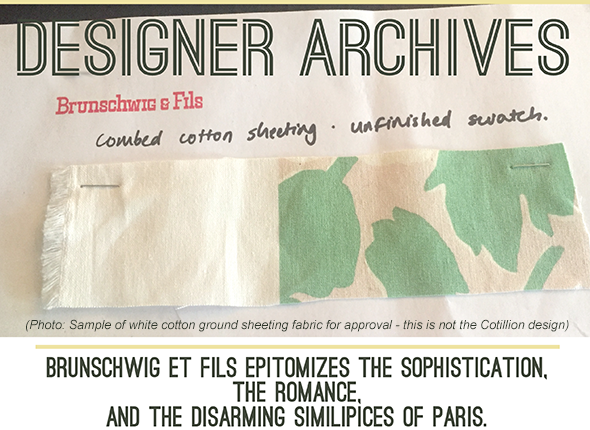 We’ve traveled to the Brunschwig et Fils manufacturer’s archives in France to reproduce the historic 1984 fabric called Cotillion. This process is very special as many of Brunschwig’s designs are no longer in circulation, however they remain in the archives of their fabric manufacturers. Brunschwig et Fils has a vast range of luxurious fabrics, wallpapers, trimmings and upholstered furniture. Their motto “Good Design Is Forever” holds true today as their fabrics can be updated, recolored and reproduced when needed. Stay tuned for the strike off of the 2018 reproduction of their Cotillion fabric in blue on a white cotton ground as it was originally conceived.